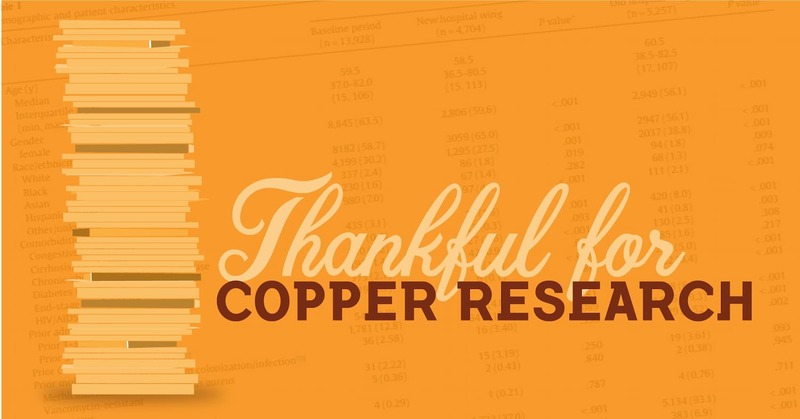 This Thanksgiving season we are grateful for the growing body of research into the biocidal activity of copper - in any form. Over the past two years, numerous studies have emerged from all over the world demonstrating the ability of copper to not only kill bacteria in the lab, but also in patient rooms. We are thankful for this research because it serves to solidify the scientific foundation upon which our mission is built: To lead with the science and let the data speak for itself. And also because it brings us closer to the ultimate goal of zero harm. When medical researchers first started looking into copper with earnest in the early 2000s, the general belief was that copper may have some biocidal activity, but not to the point of making a difference for hospital patients. Copper was often lumped in with many other products touted as cure-alls for bioburden reduction, products making public health claims that were not verified or evidence-based. However, over the past two years, numerous studies - not just those involving our material - have emerged confirming that copper can reduce bioburden in patient rooms. The studies of EOScu even went so far as to link that bioburden reduction to a statistically significant reduction of healthcare-associated infections. Why are we grateful for all copper research, not just that involving EOScu? Because we lead with the science - any and all good quality data. We support the goals of independent research, where scientists and physicians can put a material through the paces and provide the world with data unfettered by corporate sponsorship or other influences. With good science, we all win. And in the case of copper, when copper shines in the hospital room, we all benefit. So in honor of Thanksgiving and the philosophy that science is a table we can all gather around as friends and colleagues, here is a list of recent research that demonstrates the biocidal activity of copper. On behalf of all of us here at EOScu, we wish you and your family a happy Thanksgiving! © EOS Surfaces and EOScu Blog, 2014. Unauthorized use and/or duplication of this material without express and written permission from this blog’s author and/or owner is strictly prohibited. Excerpts and links may be used, provided that full and clear credit is given to EOS Surfaces and EOScu Blog with appropriate and specific direction to the original content.